I am not sure how that is very different than other world religions. 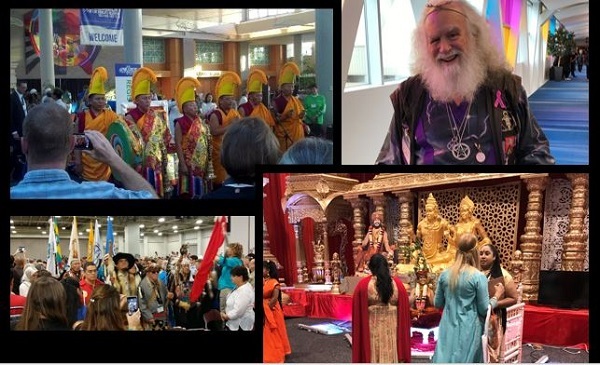 If everyone in the world joined any one religion, abandoning their own, the world would be calm, peaceful and safe…for about 10 minutes, until groups started splitting off to create better, more enlightened spiritual paths to Paradise. The walls that were torn down would have to go right back up to protect all the groups from polluting heresies. The problem is the human condition. On the one hand, many people do crave peace and unity. They don’t want conflict – not at all – but unfortunately, they want peace on their own terms and will separate and/or fight for those terms. Other people want dominance more than peace and will fight for the rewards of conquering and ruling. In both cases, God is an afterthought, or no thought at all. John Lennon’s song seems more popular today than when it was released and could easily serve as the theme song of the Parliament of the World’s Religions. The Parliament is an up close and personal live demonstration of what we just said. The purpose of the Parliament is to get all religions to agree on The Global Ethic – a list of about four things – but after 25 years they have been unable to accomplish their goal because they cannot agree on those few things. …. we are entering an age of universalism. Wherever you turn, one speaks about global education, global information, global communications — every profession on Earth now is acquiring a global dimension. The whole humanity is becoming interdependent, is becoming one. He had come to realize that a one world government isn’t possible without a one world religion, and he and other founders hoped that the Parliament would lead to this one world religion. There is no doubt that the desire for peaceful co-existence is there amongst the attendees. Joy and I spent time interviewing various groups, one of which was the Islamic contingent. Joy spoke with the wife of the leader of the Muslim group, who was a warm and delightful woman who hoped that the Parliament would bring peace to the world and especially her homeland, where her family was being killed by the Hindus there. Here in the United States she had found a neighbor, a born-again Christian whose kindness towards her convinced her that people could live peacefully side by side with people that did not agree with one’s view of God. After she talked fervently of peace and harmony, Joy asked her if she agreed with the whole one world religion idea that was heavily promoted at the Parliament. The woman was emphatic in voicing her support for the idea, saying that God has many prophets, and it was perfectly OK if people followed different prophets. Joy then asked her specifically about the Mormons (in a room down the hall) whose prophet, Joseph Smith, taught that there were many, many gods, and that in fact it was man’s destiny to become the god of his very own planet. She then became very uncomfortable with the discussion. Oh NO, she said, very emphatically. There is only ONE God – just one! How then, Joy asked, could Joseph Smith be a true prophet of God? Was it perfectly OK for people to follow him? To her credit, she could not go there, so that was pretty much the demise of the rainbow unicorn happy talk of all roads leading to god, as far as she was concerned. But she was a dear and lovely woman, and we prayed for her salvation. It wasn’t long into that Parliament in 1993 that human nature kicked right in when a fight broke out between the Hindus and Muslims during a main session. The Wiccans jumped into action and started a circle dance to bring back harmony and oneness. Harmony and peace were restored with the arrival of the Chicago Police who did indeed bring order to the chaos. And it wasn’t just the Muslims and Hindus that had issues. The Jewish contingent left when it was announced that the racist and anti-Semitic Louis Farrakhan would be speaking. I guess we can’t expect perfect oneness overnight. What the proponents of one world religion must accomplish is a wholesale abandonment of TRUTH. Absolute TRUTH is the enemy of peace and harmony and must be stamped out. They made fun of the very idea of religious truth at every opportunity. Still, their job will not be easy, because, as we learned at that Parliament, people believe instinctively in TRUTH, and assume that they can spot it when they see or hear it. We believe they will eventually accomplish their goal of creating a one world religion, and they are making great strides in that effort, but it may in the end require a great deal of force to implement – which is probably where the one world government comes in. If the whole world is under one government entity, where can people run if they are oppressed? The Bill of Rights will undoubtedly be put to the shredder. But you know, sometimes you have to break some eggs – or legs – or whatever. I (Don) and a few other evangelical apologists make the trek to the Parliament (they hold their conferences every 3-6 years or so) to talk with those who attend. Most of them are very cordial and open to dialogue. Of course, they are looking for two things – Peaceful co-existence and the opportunity to recruit others to their own religious views, which one would assume they must believe are, you know, TRUE. Their religion, if accepted by all, would then result in true peace and harmony. The theme this year was “The Power of Inclusion, the Power of Love.” Boy, that really sounds great! They really pushed again the idea of tolerance, or at least tolerance towards those who agree with them but not so much toward those who disagree. And therein lies the problem. One doesn’t need to tolerate people that they agree with! It’s the people one does not agree with who must be tolerated, correct? Jim Wallis from Sojourners Magazine was there to do his opening night plenary session about how evil conservatives are. Does that sound tolerant? 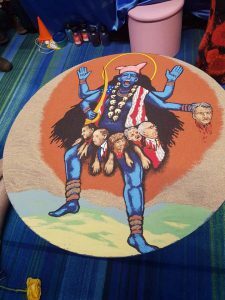 A Baptist minister created a Mandala of Kali, the Hindu goddess of death and destruction, holding the severed head of Brett Kavanaugh in one hand and the heads of the senators who tipped the vote in favor of the nomination on a belt around her waist. At the end of the Parliament, a ritual was performed calling for the destruction of these individuals. We can’t see how “The Power of Inclusion, the Power of Love” was manifested in these events exactly. Despite these demonstrations of great animus against conservatives and evangelicals, our group of about a dozen or so evangelical conservatives had many opportunities to talk one on one with some who were attending and some who were manning the exhibition areas. I let them know I was evangelical, conservative and a member of the Evangelical Press Association and wanted to know why they were there and what they believed. We told them truthfully that we wanted to receive their ideas right from the source, so as not to inadvertently misrepresent what they believe. At the same time, we had opportunities to correct falsehoods the attendees believed about us along the way. Those who make that confession in this life will meet God face to face and blessedly dwell with Him eternally. Those who deny God’s truth in this life will still make that confession to God and then be eternally separated from God because it will be forever too late.